Hippity Hoppity Easter is on it's way! 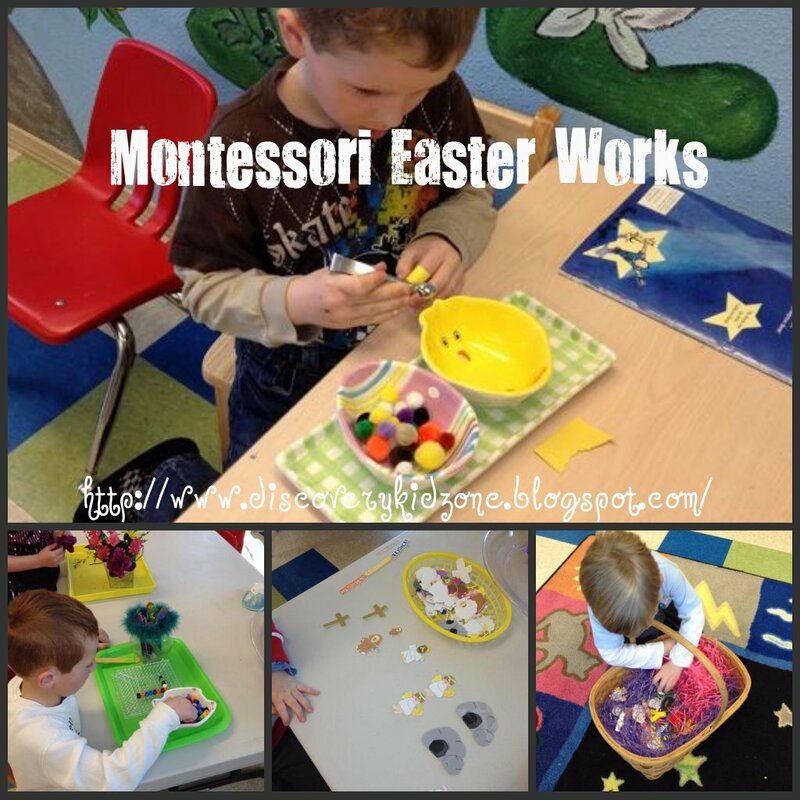 I am sorry this post is a bit long but I wanted to give you a good visual of all our Easter works. Most of these works will stay on our shelves until May. 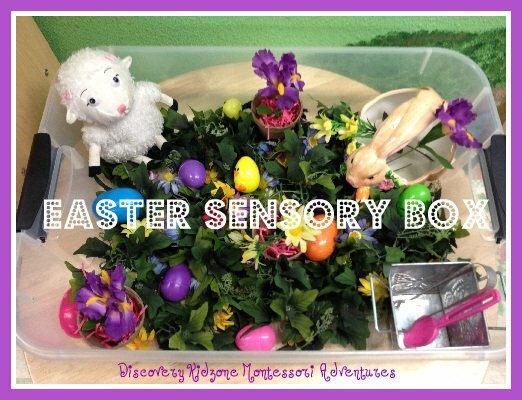 This is our Easter Sensory box. It has pots, flowers, eggs and scoops. 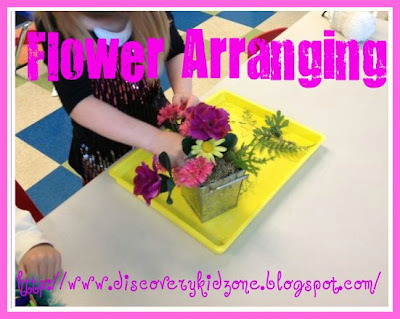 Flower arranging is a work that encourages fine motor development and also teaches grace and courteousy. It is a foam floral cube inside a pot with silk flowers to arrange. I made these letter sticks from tongue depressors and foam letters. 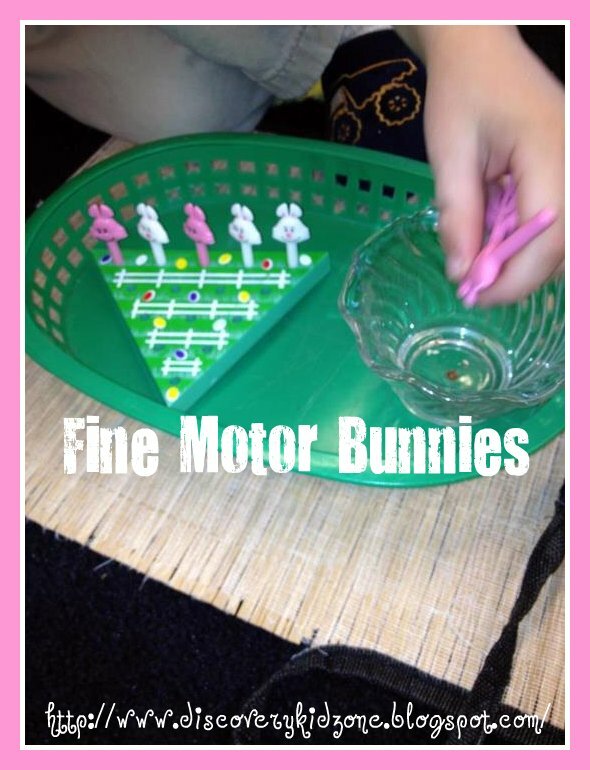 These can be uses for fine motor development. tactile learning, abc recognition, spelling. beginning sounds and ABC order. In this work they choose a letter stick then build the letter with the beads. 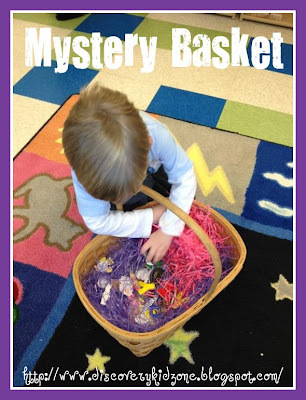 Mystery bag and Basket is a Montessori activity where you describe an object and the child using clues and tactile exploration to guess the object. 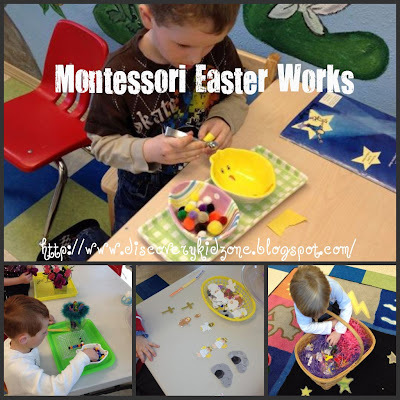 In this activity I used Easter grass to hide the objects. The objects are wooden letters from Melissa and Doug. This is a medium sized foam ball. We called it an egg, the kids used the pipe cleaners to stick in the egg. These are oval shaped pieces of paper cut out and laminated. The child grades them from smallest to largest. These are foam stickers from the Dollar Store. 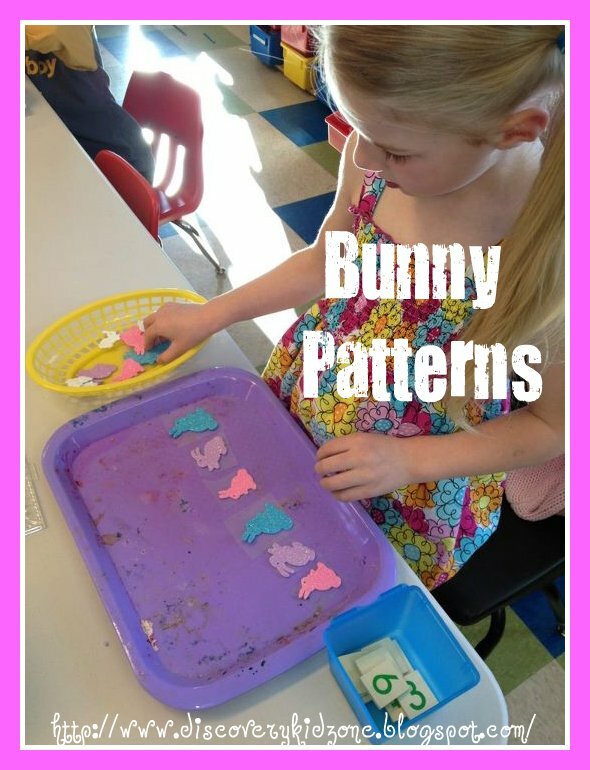 The kids make patterns and count with them. This is my FAVORITE Easter book. 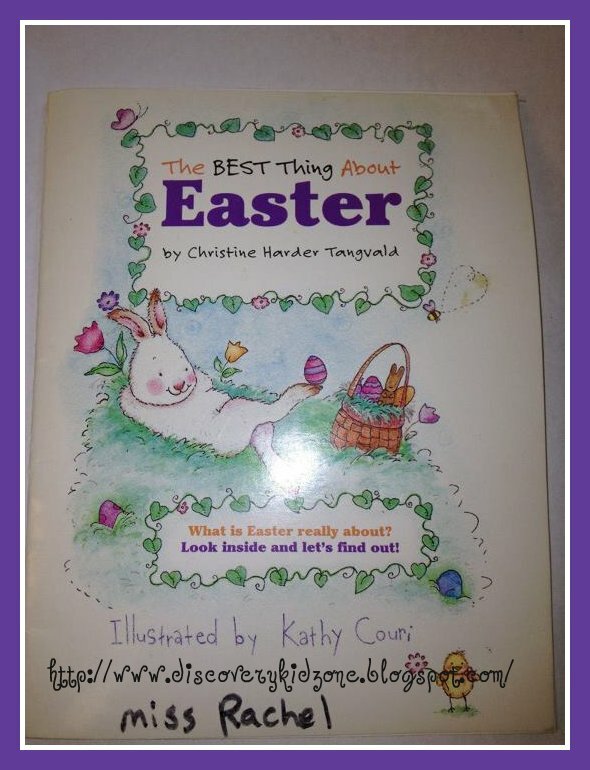 It talks about all the fun things that go along with Easter as well as the BEST thing about Easter. 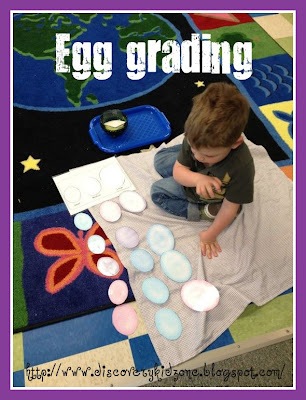 This is an extension activity I do to reinforce the story above. 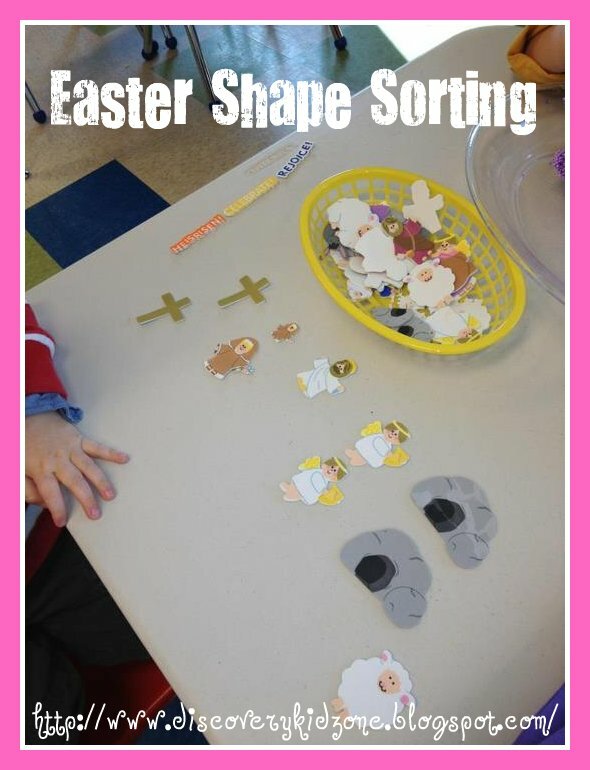 The kids sort the Easter objects. Later in the week we make a craft with these objects. Here are the letters from the mystery basket. 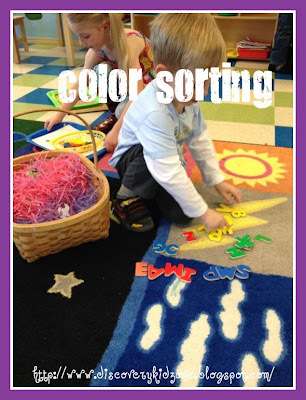 This child decided on his own to sort them by colors! LOVE IT!!! This work is also from the Dollar Store. 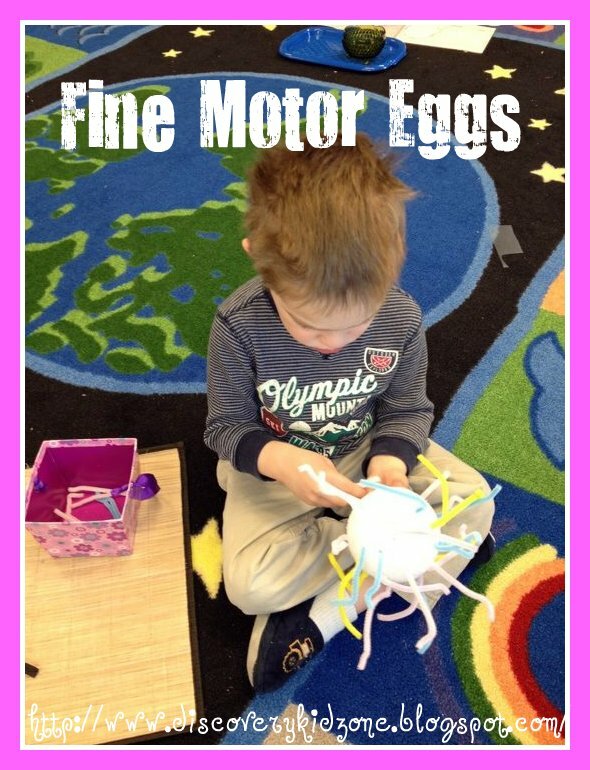 I uses it as a fine motor activity. The younger children take the bunny pegs out and place them in the triangle. This month we are studying birds. 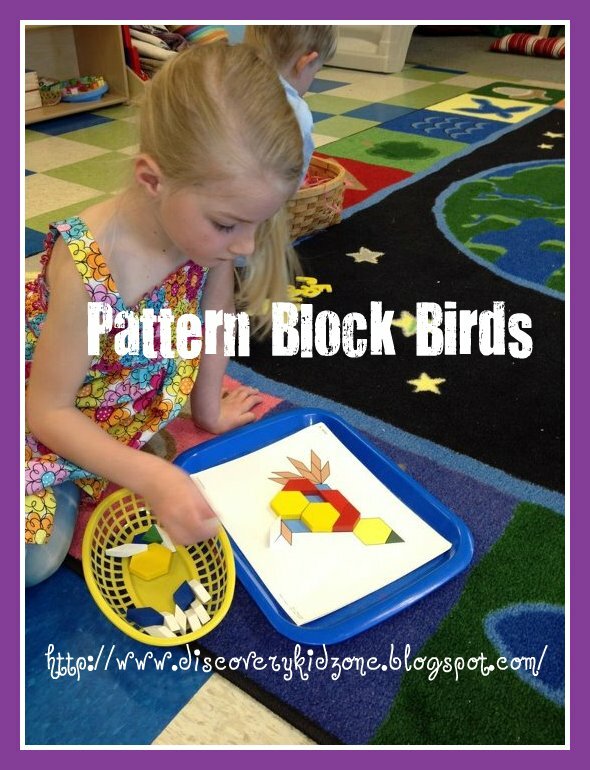 These are pattern block birds. This is another extension to our story. The child draws a picture of the best thing about Easter. 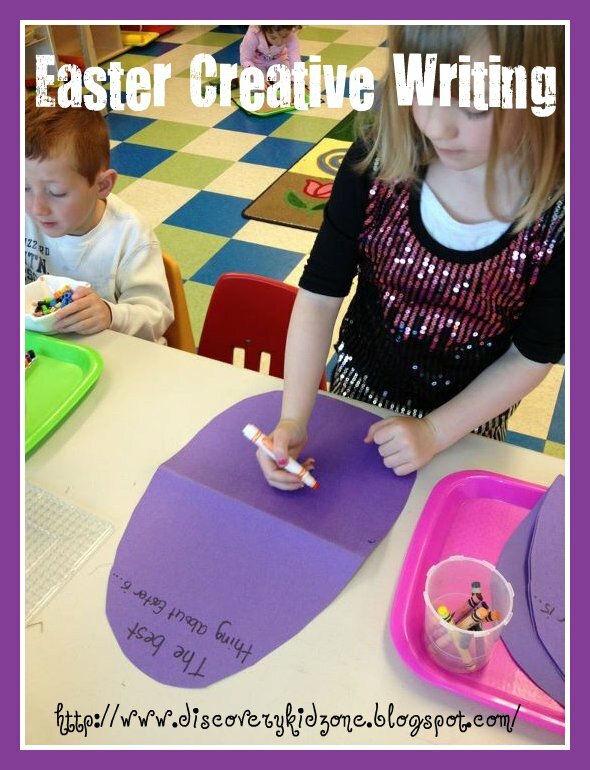 When they are finished they can write, label or dictate what the best thing about Easter is!! Here is the floam again! I like to use it for different works. 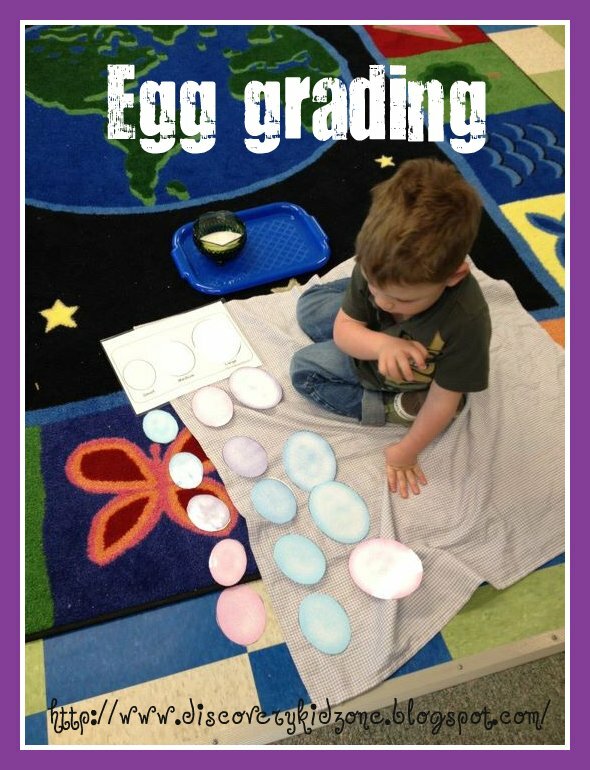 At this work the child makes an egg shape and decorates it with the items in the paper mache egg. Last but certainly not least is balloon painting bunny ears. This activity was so much fun I could write an entire post just on it. We were painting bunny ears and I couldn't find our corks. I looked through my supply closet and decided it would be fun to paint with balloons. 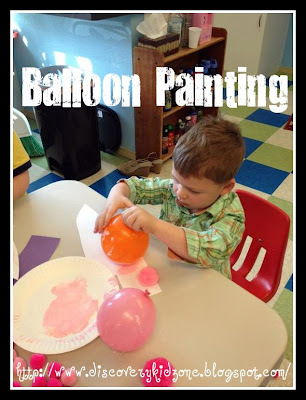 I blew up balloons in different sizes and we mixed red and white paints. The kids came to the table and "sponge painted" with the balloons. I can't wait to paint with balloons again!! Have a happy and meaningful Easter!! 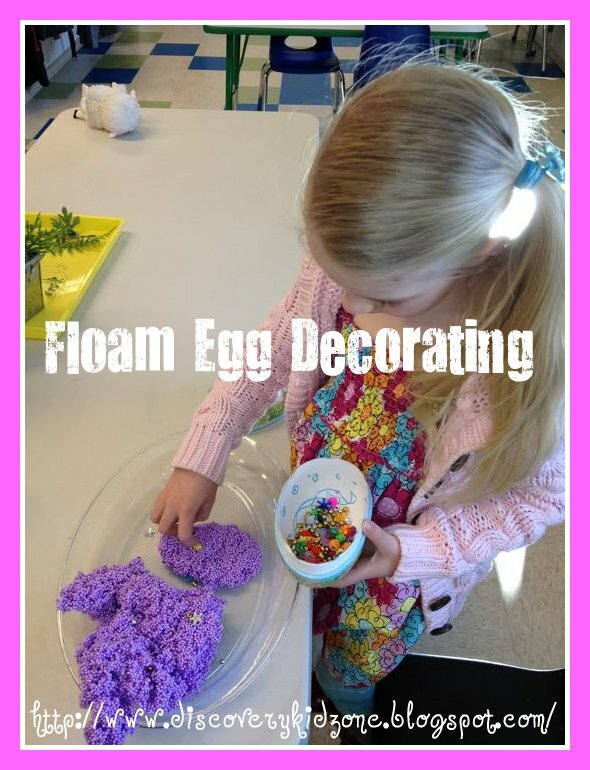 Dan and Mia enjoyed making Fabrage eggs. with home made play doe and my old broken jewelry. They are kinda funny, they look like dinosaur eggs. big and lumpy! But it was fun. I just realized that dancing grandma was my grandma haha!! Thanks for checking out my blog! Wow! Thanks, I am super flattered! I will be by for sure! I took a week off from blogging but will be back this week. What great ideas! 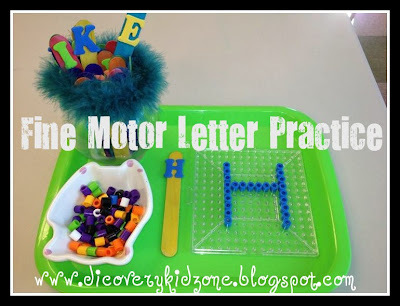 Where did you get that little tray for the beads to make the letters? If you have a free second, please e-mail me?! (Carlaroni@yahoo.com) Thanks so much!